This look is so pretty, I love these espadrilles. Thank you Rachelle! I love the ones you have in black! I love the look of a denim jacket and it's so versatile and easy to style but unfortunately I hate how polluting denim is so I'm gonna to pass on it but maybe one day they'll find a way to make denim more eco-friendly and then I'll definitely get one. That’s great Marta! Have you tried eco friendly denim brands like everlane? I’ve heard wonderful things about them in particular, they recycle everything even scraps. I know sustainable clothing is on a lot of minds. I need to educate myself more in this department! What a great spring look! I don't recall seeing you in a denim jacket before? I know you said this is a recent purchase but I can't remember if you've ever worn a different one? Anyway, this one looks great on you and I agree, it's a great staple for Spring. Have fun in Palm Springs this weekend! 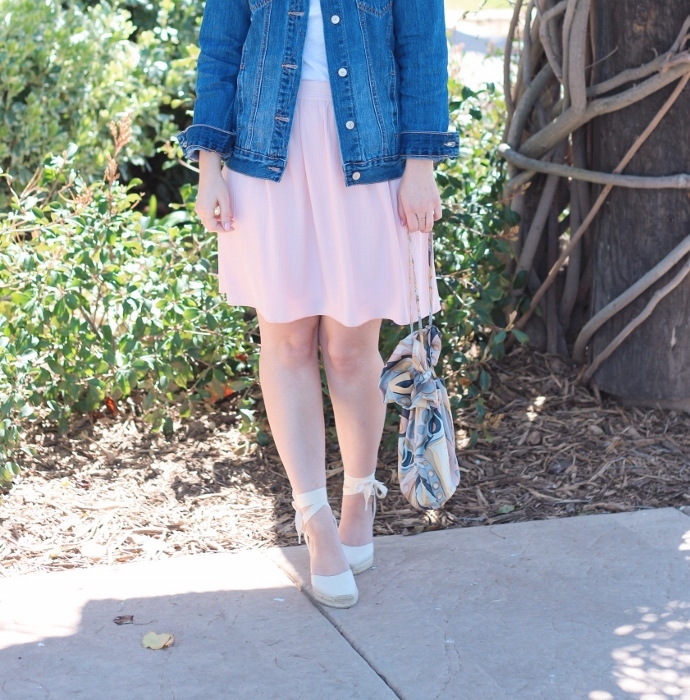 A denim jacket is definitely a spring staple for me! It's a great layering piece and goes with everything! Thank you Ruth, I’m happy you agree!